It's that time of the year again. During these last two months of the year people are generally more aware of how important it is to give and that is great. I have probably received 10 different envelopes in the mail requesting that I send money for meals at Thanksgiving and clothing and many other causes. 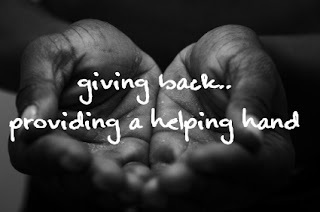 I love to give and I love the atmosphere that it creates as well. I woke up today thinking about the amazing power of these two words that are just about synonymous in my opinion. We have all given thanks in one way or another at some point in our lives. When you think about it, giving thanks is something that can be expressed with a tangible gift as well as some energy exchanged from your soul to another. It is also true that when you give, you are exchanging thanks in the form of something that cannot be seen that is sure to reach the target person or group as well. So forming one word and creating this whole movement around it is truly a gift. I have the amazing gift of having several places to go each and every holiday season be it Christmas or Thanksgiving. So this year I am seeking the best place to give straight from my self. There are many soup kitchens that will work around the clock days before Thanksgiving and so there are no shortage of opportunities there. I may just purchase some meals on my own and just deliver them randomly, I just don't know yet. My reason for posting today is that I am continually reaching inside to create this vibe all of the time. What if I was to arrange a "Thanksgiving" in January party? People would bring a dish as well as one thing that they want to give away to a less fortunate person and then we would collectively decide how it will be delivered and we could do it as a group! Imagine the power in that? We are always thanking someone for something and we can always give not matter what. I am not downplaying the actual historical meaning of Thanksgiving at all, I just want to sustain this consciousness for a longer period of time. This part of the year seems very Pavlovian to me as I mature. These thoughts scurried through my head today as I woke up almost instantly. So let's keep giving thanks, keep giving period, and continue to shave off those parts of our lives that we don't use or are not as grateful for in the end. Making a difference is not a seasonal action. Please send me any suggestions that you have by commenting below. Just click on the comments word below and type away!! !Get out there and create some magic!!! !